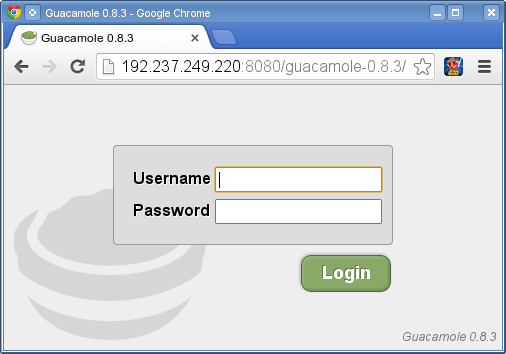 Guacamole is a program to control a Linux desktop over the network in a browser. Sometimes in your Linux life, you need to control your servers in the internet with a graphical user interface. This is tedious when you are behind a corporate firewall blocking ssh requests to the public internet. Typical corporate firewalls only allow proxified client access to port 80, 8080 and 443 in the public internet. 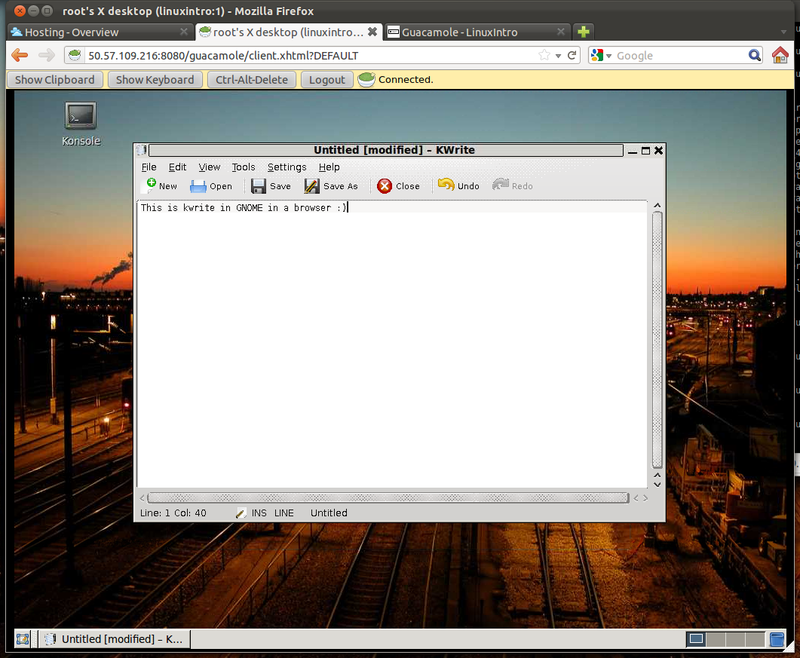 One way to go is to use a browser to display a Linux desktop. The solution is guacamole. surf to http://localhost:8080/guacamole-0.9.3. A folder /var/lib/tomcat6/webapps/guacamole-0.9.3 will be created with some content. We will need that later. Now when you click on "Default" you will see your VNC desktop in your browser. APACHE_MODULES="actions alias auth_basic proxy proxy_http authn_file authz_host authz_groupfile authz_default authz_user autoindex cgi dir env expires include log_config mime negotiation setenvif ssl userdir php5"
make sure the classpath in /etc/guacamole/guacamole.properties is correct, e.g. 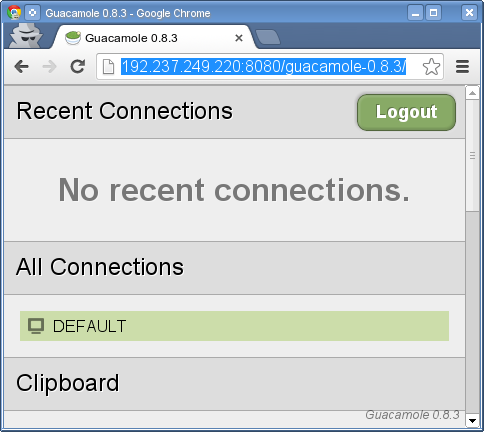 so the problem is that libguac-client-vnc.so is missing. now the error message changed from "server error" to "unauthorized"
Failed to execute 'send' on 'XMLHttpRequest': Failed to load 'http://162.209.103.145:8080/guacamole-0.8.3/login'. It probably means that tomcat is not running. It must be possible to connect to port 8080, a java process for tomcat must be running. This page was last modified on 15 January 2016, at 08:37. This page has been accessed 73,932 times.